Canada was one of the first users of the “jeep”. The first Canadian Army “Jeep” was a 1936 Ford-Marmon-Harrington half-track used by the Royal Canadian Artillery. The soldiers called it a “Jeep”. One of these survives and it is on display at the Canadian War Museum. Canadian Army jeep ambulance in action taking a wounded soldier back for medical care in Normandy (France) in 1944. Helmets indicate the soldiers are in the 3rd Canadian Infantry Division. One of the 1936 “Jeep” is preserved at the Canadian War Museum and can be seen in their VIMY HOUSE warehouse facility. The preserved example does not have the 18 pounder limber (caisson to U.S. people) bodies mounted on the rear deck (4 of them). Later when what we now know as the jeep was developed, Canada tested a couple of the first 70 jeeps made, then tested the Willys MA, bought some Ford GP jeeps, then 5,000 custom made Willys MB jeeps (called the W-LU 440-M-PERS-1) and then some ‘off the shelf’ jeeps – Willys MB, Ford GPW, Ford GPA. Right to left: Willys MA, Ford GP and a standard WWII MB or GPW jeep. MVPA Convention, Portland, Oregon. 1990s. A Ford GP in Canadian service. This one travelled across Canada on the Army Train c.1942 along with a Valentine tank, searchlight, 8 Cwt 4×2 truck etc. Slat grill Willys W-LU 440-M-PERS-1 jeep made for the Canadian Army on Contract CDLV 242. 1,500 were made on this contract, and 500 more on CDLV 241 for home service in Canada. Stamped grill Willys W-LU 440-M-PERS-1 jeep made for the Canadian Army on contract CDLV 505. This contract was made in four batches during 1942. Early batches are “script” WILLYS, no blackout drive light etc. Later examples have no name and have the BODL etc. GPA Amphibious jeep in British/Canadian service. General Harry Foster and Prime Minister MacKenzie King inspecting the vehicles. England. 1944 May 18. Canada bought 31 of these for use in Canada and overseas the Canadian Army had acquired 3 by the end of 1944. Tracked Jeep Mk. I Photos and story to come. Tracked Jeep Mk. II Photo and story to come. On Willys jeeps, the serial number appeared on one of the dash data plates. On early models the data plates were bolted to the dash, and from the Spring of 1942, were bolted to the glove box. When stamped the “MB” prefix was left off. e.g. 119021 or 155796 were two that I used to own. Early Canadian contract jeeps had brass data plates and they were custom made by Willys for the Canadian contracts. //Standard US version of the Willys dash/glove box data plate. This one is of aluminum. The serial number for the frame was the same number, though often with an MB prefix e.g. MB155796. On early MBs the data plate was on the inside left frame rail, just behind the front bumper. About mid-war, the size grew and the words SCOUT CAR etc. were added.Near the end of the was the data plate was moved the the right inside frame rail. Early style was on the left inside frame// Larger type frame data plate. The body tub had a serial number but it is not directly connected to the vehicle serial number. This is because the bodies were made by a contractor and this was their control number. There is a very ROUGH correlation e.g. 155796 had tub 60260. Subtract 100,000 as that is where Willys Serial numbers started, whereas the tubs probably started at 1. Colin Stevens’ last jeep, a 1944 Willys MB jeep was brought back from overseas from Norway. VDN1121. This one is now owned by Jim Fraser in Arnprior, Ontario, Canada. Colin’s 1944 Willys MB in November, 1999 in the Beatty Street Armoury (1890s military building) in Vancouver, BC, Canada. 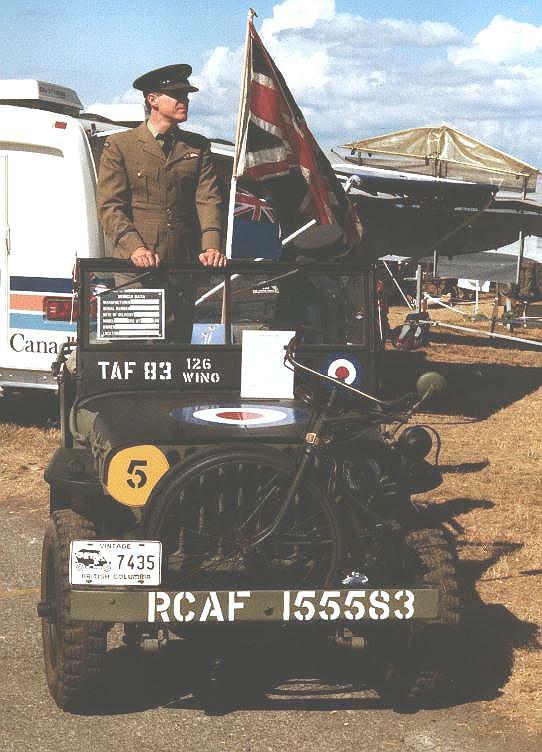 Colin with jeep at the Abbotsford Air Show, August 2000 Aug. It has since been painted in airborne markings again. Applying Mickey Mouse Ear camouflage paint by big paintbrush in September 1942 to a Canadian Contract CDLV 505 jeep in England. 1944-45 Dutch cartoon about Canadian jeep driver and Dutch cyclist. MB119021 as found, on the try before you buy test drive at Christina Lake, BC. Jeep had been brought in from Alberta. MB119021 in Burnaby – partly restored. Delivering MB119021 to Fort Rodd Hill National Historic Park. July 2 1942 stamped grill script Willys MB serial number MB155796. Shown as found with army hard top – after jeep repainted brown from the blue; just before I sold it c. 1995. It has recently changed hands and the new owner has contacted me. I found all of the original markings on this jeep and determined that in 1943 this jeep served as a wireless (radio) jeep with Divisional Signals, 7th Canadian Division in Debert, Nova Scotia. Its DND number was 61-261. Tub number 60260. 1942 Ford GPA amphibious jeep SN GPA4545 made about Dec. 22, 1942. Shown here the day we picked it up in early 2001. Sold to a restorer in the USA. 1952 M38CDN, all original including original markings. It was used by a GSO-3 of 1 Canadian Division. SOLD. 1967 M38A1CDN2 67-07995 (ex-Seaforth Highlanders of Canada, Headquarters). Sold to a collector in B.C. SOLD. 1942 Willys MB-BRT (i.e. British Contract) made March 13, 1942. Serial number 127345. Unrestored and rusty. Quite original except for grey paint. 1953 M100CDN 1/4 Ton trailer. CAR 70216 ex-Seaforth Highlanders of Canada where it was towed by the jeep above – 67-07995! This trailer was later used by the Royal Westminster Regiment. WWII 1/4 ton jeep trailer. Maker unknown at this time. 1940s military style. Ex-California. Modified. Rear bumper, rear landing leg, over-ride brakes, extra grab handles on the frame. For more photos of military vehicles that I have owned, including these jeeps, click here. I am particularly interested in Canadian Contract jeeps of World War II. I have a database of several thousand military jeeps. I have been gathering serial numbers, dates of production, contracts, engine serial numbers, script – yes or no, original painted numbers and markings, owner’s name/city/state or province/country, original markings, history etc. I try to help owners and museums as many jeeps are missing data plates and dates. I also try to put owners of vehicles made close to each other in touch with each other. So far I have found several sets of sequentially serial numbered jeeps – some now separated by a few miles, and others by over 3,000 miles. I welcome input from owners etc. to add to this data base and I am glad to try to answer questions. Ex-Canadian jeeps have turned up in Japan, Sweden, Norway, the UK, USA etc. I am glad to help jeep owners try to date their jeeps if they have a serial number but no date. Likewise if they have an M38A1CDN2 jeep, if they have a CAR/CFR number I can probably tell them the serial number. The G503 Jeep Web site, forums etc. Search for G503 on the Internet. A live link is not provided here as that is not a secure web site.